Monsters of silly and scary sorts abound during Halloween season. And wacky sorts, too, especially those residing in the wacky world of WuzzIts. 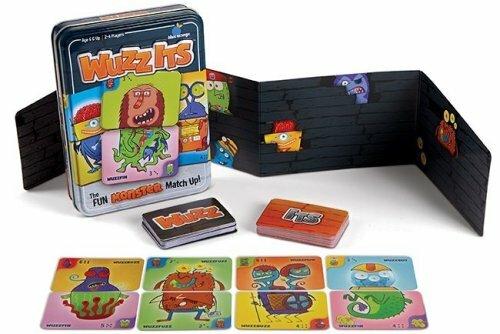 WuzzIts is a monster match up game from Blue Orange games, for 2 to 4 players, ages 6 and up. Fortunately, my favorite 6-year-old — my grandson Bubby — came to visit not long after I received a free sample of the game for review. Bubby and I took turns swapping, matching and concentrating on creating wacky WuzzIts to win the game. As the number of monster combinations was a tad overwhelming — for both of us, at first — Bubby and I didn't use the "swap" cards or the Winker and Stinker cards. And we did take a little longer than the estimated 20 minutes of play on our first round. But once we got the hang of it, I ended up being the first to call "WUZZIT!" to proclaim myself the winner of monster making. Bubby took his time verifying and confirming I had the monsters correctly matched and had rightfully earned the winning title. Yep! It was for real: Gramma was the first to create four monsters and win the game. Unfortunately, it was in writing this review that I realized we only needed to build three monsters — which means Bubby should have been named the winner. Darnit! Guess that means we'll have to play WuzzIts again! And I'm sure we will. WuzzIts is not only fun, it helps build the skills of visual perception, strategy, arithmetic, and social play. Bubby said he most loved the huge number of monsters he could make with the WuzzIts game. 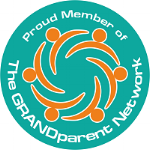 What Gramma loved most was that it was time well spent with my favorite 6-year-old grandchild — courtesy one of my favorite (and most innovative) game makers. WuzzIts retails for $12.99 and can be purchased directly from Blue Orange Games or at numerous retailers across the country. For more information and to locate a retailer, visit Blue Orange Games. Disclosure: I received this product free for review; opinions and anecdotes are my own.